It is good to see Second Run releasing Albert Serra's Story of my Death. Best know for Birdsong, Serra's reputation on the festival circuit is high, but cinema screenings of his work in the UK are not easy to come across. Story of My Death is a pretty oblique account of Dracula and Casanova, told with such a feeling for light and shade that the film has a sense all its own even if you are not quite sure what is going on. The opening sequence is an especial pleasure, and sets the tone for a film that is never less than relaxed in its style, reflective in its storytelling. Many people will know of Vêra Chytilová for Daisies, but those taken by the exuberance of the earlier film will also get something out of Fruit of Paradise (Second Run). A retelling of Adam and Eve, the film is cheerfully symbolic and often pretty obscure in its storytelling, but so literally colourful that there are pleasures aplenty. 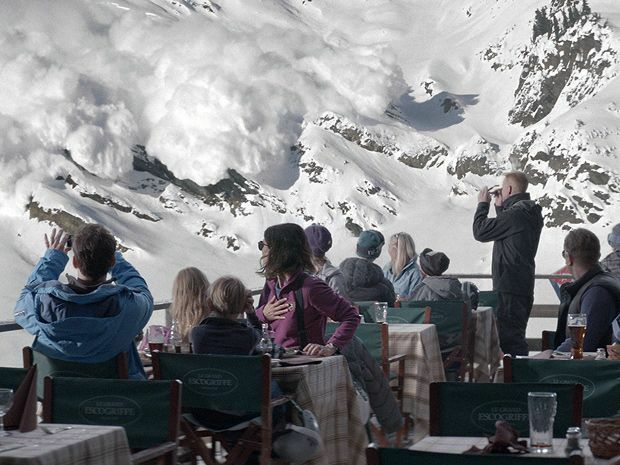 Force Majeure (Artificial Eye) has two great sequences: the false avalanche early on and a scene on a bus near the end. In between it is as though Bergman, Polanski and Kubrick have been thrown into the mix. This suggests a film of set-pieces and homages, but Ruben Östland's movie is an integrated account of a disintegrating family, with the avalanche sequence setting in motion a crisis that was probably never going to be far away. Timbuktu (Artificial Eye) has an elegiac tone that might not seem to quite suit its subject. Here we have a cattle herder whose quiet life is disturbed by political extremists. Director Abderrahmane Sissako refuses to allow the storytelling to side with the hot-headed radicals, it remains throughout a beautiful subdued, quiet work, with occasional bursts of violence. A Pigeon Sat on a Branch Reflecting on Existence (Artificial Eye) is Roy (Songs from the Second Floor) Andersson's latest exercise in mise en scène. As always the director works in long sequence shots where everything is carefully prepared and the action unravels within the shot. Though action might be a bit of an exaggeration, these are dull and dulled lives in Scandinavia as we follow, amongst other things, a couple of travelling salesmen. A final word for The Green Prince (Artificial Eye), an account of an incredible friendship between a Palestinian informer and an Israeli agent that encompasses in its compact telling a relationship between two people of different backgrounds who find a higher value than the conflict they find themselves in. Some might say the film bypasses some of the political issues; others that it tries to find a first principle that goes beyond them.